Simple, strong design will give you many years of comfort as you get in and out of bed. Light, yet, sturdy, this frame allows you to get out of bed without any other assistance. Adjust for fit and height. 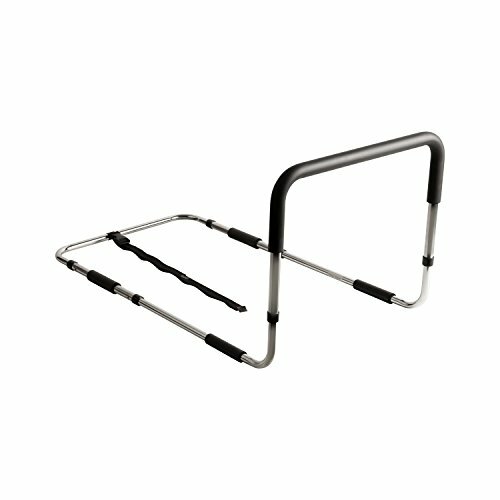 Pro-grip handles ensures non-slip handling. Fits any bed and desired height. No need for floor supports that stub your toes in the middle of the night. Your floor stays clear and you stay supported! Ensures Safety While Getting in and Out of Bed--Easy to Use! Light, yet, sturdy, this frame allows you to get out of bed without any other assistance. Adjust for fit and height. Pro-grip handles ensures non-slip handling. Fits any bed and desired height. No need for floor supports that stub your toes in the middle of the night.